Hard to call a favourite this early and hard to rule out any team not having a chance of winning it (unless Parnells cannot field). 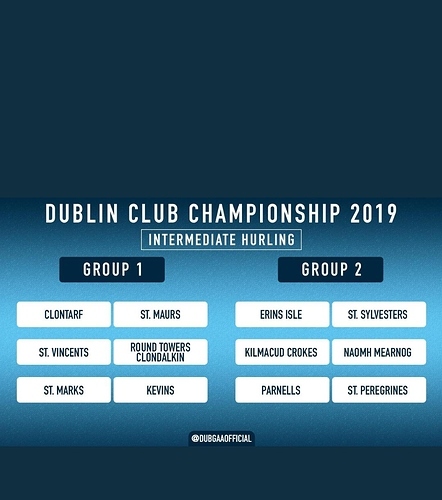 Towers have a few years experience in Senior B behind them, Maurs are on the up, Syls and Scoil were probably favourites last year and will be improved, Clontarf made the semi finals last season. So this should be a very well matched championship. Scoil listed in the Senior B Championship also? Something tells me we might have another Thomas Davis fiasco unfolding here. From what I heard Marks requested to stay Inter and if that’s the case I would have thought Towers Clondalkin wouldn’t have been relegated from Senior B.
I also heard this afternoon from a cousin involved in coaching out there that Marks requested to stay in Inter. And it looks like it was accepted. I wonder is this a first. Have to say I’m disappointed to hear that. What was the TD fiasco? Marks surprised everyone last year by making the final. They surprised everyone this year by asking to stay down so you would not know what to expect from them. Isles, Syvestors and Crokes would be my favorites to come out of group 2. Would assume Crokes 2nd team is strong. Peregrines and Parnells (will be interesting to see if Parnells last the season based on recent events) poor last year so I think they’d need a serious turnaround to make an impact. Based on last couple of years Mearnog are a mid table side. Towers And isles or peregrines to top the groups. Can’t see any other winners bar towers to be honest. They ll be a bit stronger with young O’Neill I think he name is, Dublin minor centre back last year. Presuming that is if they play him during championship, but they still have enough to win it. They were Missing several key players last year for a few months. I didn’t see them down for AHL2. Either I missed them or their AHL3 team are in Senior B etc? Yes last years form was a big surprise. Think ye had a few key players injured for a period also?